Morocco is in the north-west corner of Africa with its northern coastline along the Mediterranean Sea and its western boundary along the Atlantic Ocean. 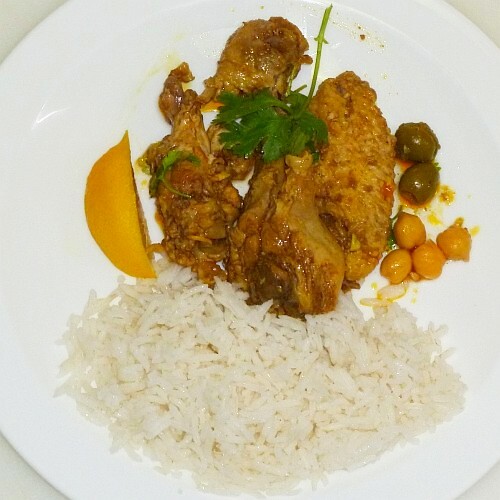 Moroccan cuisine uses a large range of Mediterranean fruits, vegetables, and meats such as beef, lamb and chicken. Morocco's culinary traditions have been influenced by Berber, Moorish, and Arab cultures. Spices are used extensively in Moroccan food, and cinnamon, cumin, turmeric and ginger are used in many traditional dishes. This recipe is flavored with lemon zest, but one Moroccan pickled lemon may be used instead. The recipe may be modified by adding 2 cloves of crushed garlic and one tablespoon of grated ginger. In a 4-quart Dutch oven heat oil over moderately high heat until hot but not smoking. Pat chicken dry and season with salt and pepper. Cook chicken until skin is golden brown. Add onion to pan and cook, stirring, until softened. Add cumin, paprika, cinnamon, zest, and flour and cook, stirring, 1 minute. Stir in water, olives, honey and add the bouillon cubes and chick peas. Cover and simmer for 10 minutes. Serve chicken on top of rice, pour sauce over chicken and sprinkle with chopped coriander. A tasty rice may be prepared by adding one cup of basmati rice to two cups of boiling water, one cinnamon stick, 3 cardamom pods and 1/8 teaspoon cumin powder. Simmer covered on low heat until all the water is absorbed by the rice and the bottom of the pan is dry, remove the cinnamon stick and cardamom pods prior to serving. 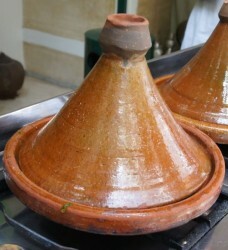 Moroccan cooking often involves the use of a tagine (also spelled tajine), which is a shallow glazed ceramic pot with a tight-fitting tall conical lid illustrated above. For a recipe such as this one, the tagine pot (without the lid) is heated at a low temperature on top of the stove with some oil. The chicken is browned in the hot oil. The other ingredients and the water are then added. The pot is then covered with the conical lid and the heat is reduced. The vapor condenses along the sides of the tall lid and the condensation continually bastes the stew. Because the lid is tall, the top stays cool and can be handled without mittens to stir the dish or add ingredients. Notice that the top of the conical lid is unglazed so that it can be gripped without slipping.